I don’t have anything really to add to this, but I wanted to bring it up. You should just read this article here. 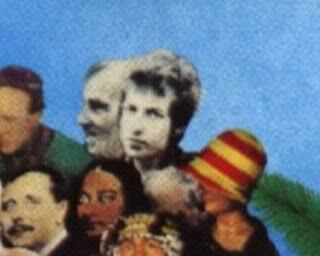 Short version: The Beatles put a picture of Dylan on the cover of Sgt Pepper’s Lonely Hearts Club Band, and so he put a picture of them on John Wesley Harding. Only you really really need to look for them. The men on the cover with Dylan, by the way, were Luxman and Purna Das, visiting South Asian musicians, and Charlie Joy, a local carpenter. Dylan is also wearing the same jacket he wore on the cover of Blonde on Blonde. 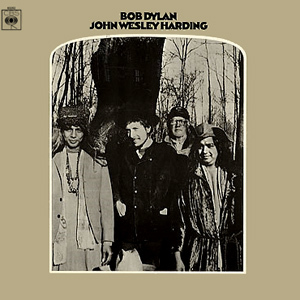 John Wesley Harding is not an album that I had listened to before this week, and so there are a number of songs on it that I had never heard. My friend Rusty said, in the comments the other day, that I’m not allowed to spend the rest of the year proclaiming “Not as good as the great albums of 1964-1966”, so I’m not going to do that. I will note that John Wesley Harding was greeted by the rock crowd of 1967 as a sell-out – a retrograde album – because it wasn’t psychedelic like Their Satanic Majesties Request by The Rolling Stones or After Bathing at Baxter’s by Jefferson Airplane (thank God, since I don’t particularly like either of those albums). The irony that magazines like Creem felt that Dylan had somehow betrayed them a year after he betrayed the Sing Out! crowd is, of course, absolutely hilarious. 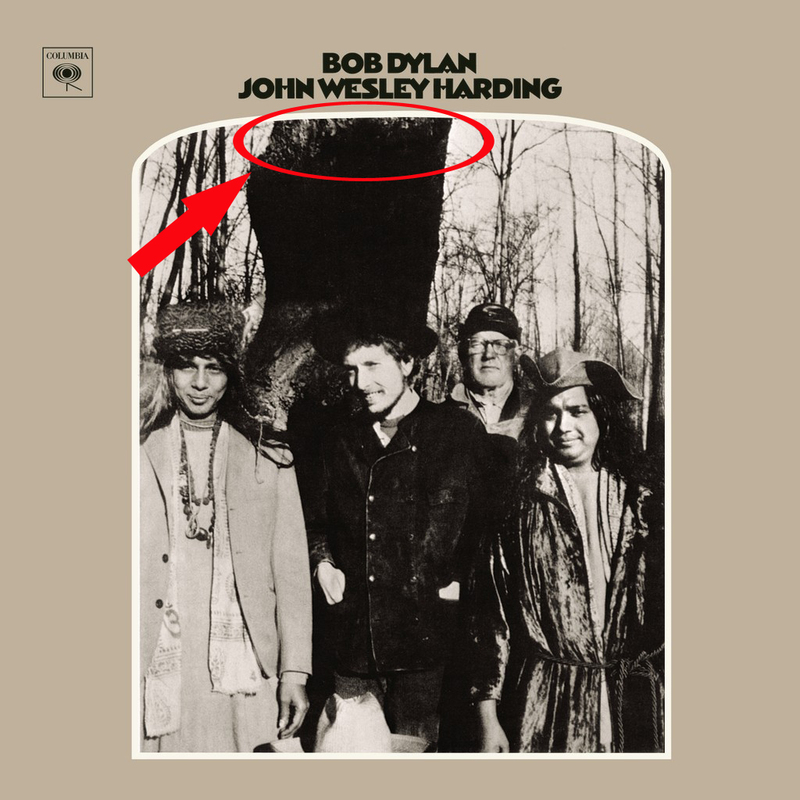 John Wesely Harding is probably the birth of Bob Dylan v.4. Recorded, like his first album, extremely quickly, it is mellow and relaxed. He has given up much of the lyrical playfulness that marked his work since Bringing It All Back Home, and the lyrics are simplified. I read something this week in which Allen Ginsberg said that Dylan made a conscious choice not to simply write lines to find another rhyme, but wanted every line of every song to contribute something overall. This is only occasionally the case. The album is a short one – twelve short songs. After the third time through it became eleven for me, as I started skipping “The Ballad of Frankie Lee and Judas Priest” every time it came on – and that’s the longest song on the album. “Frankie Lee” sounds to me just like the poetry I wrote in grade seven because I had to fulfill an English assignment. I couldn’t get the hang of meter, and then finally got the ba-dum ba-DUM ba-dum ba-DUM down and just wrote out some endless nonsense story poem (I remember writing it but have no clue what it was about). That’s this song: simplistic and simple-minded, it sounds like it is being written as it was being sung. The rest of the album avoids these kinds of disasters. The title song doesn’t really work for me. It’s charming that Dylan misspelled the name of John Wesley Hardin, adding the G that he dropped from so many earlier titles, but it’s only an okay song. “Jesse James” is a great song in this genre, but “Harding” tries to work the same territory, and it isn’t very successful. From what I’ve read about Hardin, Dylan gets pretty much every single fact wrong, but that’s probably part of the genre too. “As I Went Out One Morning” isn’t a whole lot better. I’ve listened to this about twenty times this week and I’m still not sure what it’s meant to be about. “I Dreamed I Saw St. Augustine” lifts the opening and the music of “I Dreamed I Saw Joe Hill”, which, again, is a better song. Lots of Biblical material here – presaging his born again period by a decade. Some Dylanologists even see the JWH of the title as a reference to Yaweh. I don’t know about that. “All Along the Watchtower” also has overt Biblical themes. I’ll come back to that song in another post. “Drifter’s Escape” is not bad, a swinging little nothing. It has my favourite moment on the album, the incredible way that Dylan sings “loo-oong” in the first verse like it gets caught coming out of his nose. I stop and listen for it every time. The second side opens with “Dear Landlord”, another song that people want to know who it’s about (consensus being Albert Grossman). I think that one is a keeper. “I Am a Lonesome Hobo” and “I Pity The Poor Immigrant” aren’t that good, and the lyrics to the latter make almost no sense to me at all. I’m not sure that it’s supposed to be an anti-immigrant song, but I’m also not sure what he was going for. That immigrant sure is not someone that I’d want to know, that’s for sure. In a lot of ways, the unexpected highlight of the album for me is “The Wicked Messenger”, which is one of the best kind of songs that Dylan was recording with The Band around this time as The Basement Tapes. Lovely little harmonica bits, and a short, direct and slightly mysterious song. This was one I didn’t know, but it’s a keeper. “Down Along the Cove” is also pretty good, another exceptionally slight song that is done well. This has a touch of the late-1950s pop that was an influence on Dylan before he heard Woody Guthrie. Finally, “I’ll Be Your Baby Tonight” is, if not a classic, a truly great romantic Dylan song. It’s the first of his songs to have a slide guitar in it, so it gives it a sound that blends it into Nashville Skyline nicely. He’s done a million great versions of this song, but this one is really nice. So, overall, it’s a pretty good album. About half of it is well worth keeping. It was dumped into the market at the end of 1967 with almost no hype, but it did rise as far as #2 on the American album charts. As much a break from what he had been doing as the electric material had been before it, it was very much the album of a man who didn’t seem to much care any longer what people wanted from him. Here’s Patti Smith doing “Drifter’s Escape”. Awesome. I wrote a long post about John Wesley Harding but our Internet is out (thanks, Shaw Cable, for the awesome service!) so I can’t post it or send it to my phone. While you wait, this is today’s merchandise. 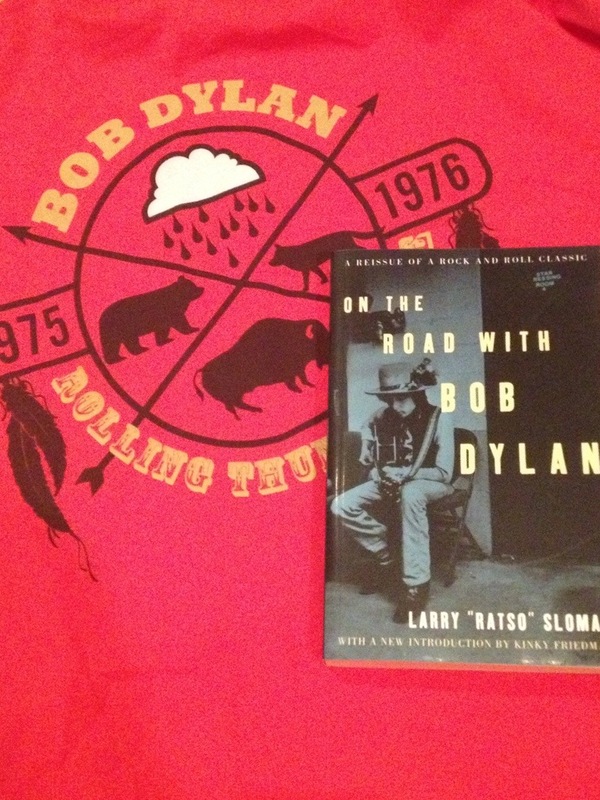 A t-shirt from the Rolling Thunder Revue and a book about that same tour. I can’t read/wear either for eight weeks, but it pays to think ahead. Listening to A Tree With Roots through my phone speaker because my sound system runs through wifi. 21st century problems….